Oops - we don't appear to have a video for the DR-9080C. 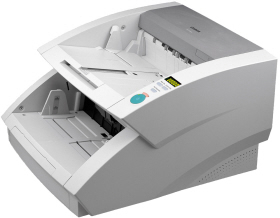 This Canon DR-9080C is fantastic, the fact that you can scan multiple sized documents in one batch is really good. It is a little noisy when running fast (low resolution black and white). But when running at 300dpi grey scale it is not so noisy and quite quiet when running in colour. To substantially increase document scanning speeds, the Canon DR-9080C document management scanner features on-board JPEG compression and a new CIS (Contact Image Sensor). As a result, it attains speeds that reach right up to 90 ppm in black and white/greyscale mode (A4 portrait, 200 dpi) and 50ppm in colour mode (A4 portrait, 200 dpi). Plus, with a maximum 180 ipm for fast duplexing, it offers unparalleled production productivity. For high quality document scanning, the DR-9080C delivers an output resolution of up to 600 x 600 dpi and offers a 'smoothing' function to reduce the moiré effect and enhance quality. Advanced text enhancement improves the legibility of light text, and a dual light sensor system prevents wrinkle shades on a document appearing on the scanned image. The DR-9080C scans up to a large A3 size, and can handle different paper formats and thicknesses in mixed batches. It also provides 24-bit colour support for use in a wide range of business applications. The DR-9080C utilises a new feeding mechanism, combined with Canon's strong and durable original retard roller system. This allows the scanner to accept a wider range of paper thicknesses and provides even more reliable paper feeding performance. The inclusion of sophisticated MultiStream technology allows simultaneous image outputs of two different scanning modes. For example, one output can be in colour and the other in black and white. The colour image can then be saved for archiving, while the mono image can be saved for OCR use.